Be the first to share your favorite memory, photo or story of Velvia. This memorial page is dedicated for family, friends and future generations to celebrate the life of their loved one. Velvia Jo Campbell Moore was born on July 27, 1935 in Sherman, Texas. To Jim Bill and Rosie Lee Campbell. She received her education from the Sherman public schools. She accepted Christ as her savior at an early age, and attended Greater New Hope Baptist Church in Sherman. In 1952, Velvia met and married USAF Airman Wheeler McCray. He and Velvia raised seven children together, and in 1965, settled in Baltimore, Maryland, where she cared for him until his death. Velvia became a member of Mt. Pleasant Church and Ministries in Baltimore, where she faithfully served in the Silver Saints, Culinary and The Who So Ever Will Club Ministries. In 1980, Velvia married Wilbert Moore, and the two shared a loving life together. “Ms. Jo”, as she was affectionately called, loved watching all types and genres of cooking, baking and traveling shows. She loved laughing, being with family, and having fun with friends and grandchildren. Because of her nature, she was called “Momma” and “Grandma” by all of her grandchildren. Her family brought much love and happiness to her life. Velvia was a loving person and her legacy to her family in one word is “LOVE”. She touched the lives of many people with her smile, food and generosity, and maintained her trademark sense of humor all the way to the end. 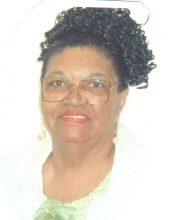 Velvia departed this world on Monday, February 4, 2019, and joins her beloved husband, her parents and children Chanrose Brown, Raynard McCray and Wheeler McCray. She is survived by, and will forever be in the hearts of: her loving children, Wheelvia Williams, Vicky Lynn Dobbins (Kevin), Van McCray and Victor McCray, brothers Don Campbell (Brenda) and William Paxton, 14 grandchildren, 17 great grandchildren a host of uncles, aunts, family members and friends, whom were blessed to know her. To send flowers or a remembrance gift to the family of Velvia Jo Moore, please visit our Tribute Store. "Email Address" would like to share the life celebration of Velvia Jo Moore. Click on the "link" to go to share a favorite memory or leave a condolence message for the family.